Recently I have become a great fan of pancakes and crepes. When I was a child we would always make sweet crepes for Fridays or as Saturday snack. My mum never liked making them as it takes ages. So I was usually the lucky one to spent at least an hour watching golden crepes and perfecting my ‘flipping’ technique. But somehow I enjoyed it, and it has it’s perks of eating hot pancakes when no-one is watching. After all I love a fresh hot crepe on it’s own. So this year on Pancake day I decided to make a chocolate crepe cake. There are so many ways on how to make them thought. But I settled for a simple recipe from my mum. Because obviously she knows best! Chocolate make it really hard to guess if the pancake is cooked and when it starts to burn. So it took me about 5 pancakes to figure out when I need to turn and not to leave the second side on for too long. Sieve the flour and cocoa to break all the lumps and them mix well with milk and eggs. Leave the batter to stand ideally for an hour or 2 in the fridge. Heat up a small frying pan with a few drops of oil. Pour one ladle of batter and spread evenly over the surface of the pan. Turn the crepe over once the edges are coming away from the pan. Each pancake takes about 2 minutes to take but be careful not to burn as batter is dark already. Leave each pancake to cool before putting on top of each other so that you don’t trap too much moisture between them. Once all pancakes are done you are ready to whip the cream. Spread the cream over each pancake and spread jam after every 5 pancakes. Once all pancakes are stacked up, spread the rest of the cream over the sides. Place a plate on top and leave in a fridge for a few hours or overnight. For chocolate ganache, bring double cream to boil and then pour over dark chocolate. Leave it to melt and mix well together to dissolve all the lump. Spread the chocolate over the cake and leave to set for about an hour. Mushrooms have not always been my favourite. As a small child growing up in a countryside I was obviously surrounded by forests full of delicious and also fatally poisonous mushrooms. I still remember the joy of finding little ‘hats’ hidden at the bases of trees. But back then I was not so keen on eating them. Of course there was that fascination with the knowledge of the pickers on which ones are good and which ones you mustn’t touch. We used to have a large loft in our house and it was perfect for drying sliced mushrooms. The aroma would fill the house for a few weeks and I used to love it. My mother was very puzzled by my obsession with the smell but my absolute disgust when it came to eating mushrooms. I think I started appreciating mushrooms only recently. It was mushroom risotto that completely changed my mind. But I am also slowly learning how limited they are in the usual supermarkets. Thank goodness some of us are lucky with a local deli that offers a selection of random and glorious mushrooms. So I have decided to experiment with some mushrooms, red wine and thyme. What could possibly go wrong? Sprinkle small pan with a little bit of olive oil and place sliced bread once hot enough. Turn the bread once it starts to warm up and brown a bit. When both sides are toasted, place on a serving plate. Add more olive oil and fry pressed garlic. Add a splash of red wine and leave to simmer to cook the alcohol away. Add the thyme so that the sauce starts to take the flavour in. if you have mushroom stock then add a tiny bit in. Once the sauce is thickened add sliced mushrooms and leave to cook for a few minutes. When mushrooms are cooked and the sauce is thickened place on each toast. And there you! A quick snack is ready for you to enjoy plus kitchen smells heavenly too. I have been neglecting the blog recently. And this is due to my oven being broken and also spending way too much time outdoors. This summer has not been very hot but then I guess I am getting used to the English mild temperatures. Unfortunately my oven decided to give up on me and it seems to be on a mission to wreck every cake I make. So let’s keep the fingers crossed for the engineer to fix it up really quickly. On the other hand I found a new yummy recipe for an unbaked cheesecake. I have been experimenting a bit with fresh fruits. I know raspberries and chocolate are a superb combination and so I have tried to mix them into the cheesecake. First, I thought it would be a great idea but then I realised that raspberries have fallen apart very quickly and therefore they got a bit lost in the mixture. So I decided to place raspberries on the biscuit base and to keep them intact. I was delighted that the raspberries did not get crushed. But I quickly realised it is not so easy to spread the chocolate on top of them. However the final cheesecake looked really lovely and tasted delicious. This cheesecake is very rich and the best way it to keep it chilled. I would strongly recommend to take it out of the fridge about half an hour before serving as it is much easier to cut. Also I prefer to eat it at the room temperature. Line the sides of 9 inch cake tine with baking paper, preferable one with high sides. Brush the side of the tin with melted butter in case the paper does not want to hold on the sides . Crush biscuits with the rolling pin, until they become breadcrumbs. Then mix with golden syrup and butter. Press the crushed biscuits to the cake tin and level out, then leave in the fridge to set. Place washed and dried raspberries on top of the biscuit base. Melt the dark chocolate over the boiling water and set aside to cool. Whip the double cream until it thickens, then add icing sugar and cream cheese. Finally add cooled chocolate to the mixture and mix well. Once all the chocolate is incorporated with the cream, transfer the mixture to the tin and spread carefully over the raspberries. Leave the cheesecake to set in the fridge for at least 4 hours before serving. I cannot say I am the biggest fan of cheesecakes. There is however a few exceptions that make me ever so tempted to try. I do love lemon&lime cheesecake by Nigella. It is rich, creamy and so lush. Well I am not one of those people that would be worried to use too much double cream. I also decided to lighten up the richness of the chocolate and cream with tangy and fresh passion fruit. It works very well and does not seem to spoil the solid texture of the cheesecake. Feel free to decorate the top with fresh raspberries or strawberries. Their bright red colour would make this dessert even more delightful. Line the sides of 9 inch cake tine with baking paper. This helps when you later try to get the cheesecake out of the tin. Crush biscuits until they form a breadcrumb texture. Then mix with golden syrup and butter. Press the biscuits to the cake tin and leave in the fridge to set. Melt the dark chocolate over bain-marie and set aside to cool. Whip the double cream then add icing sugar and cream cheese. Add cooled chocolate to the mixture and passion fruit. Mix well and then transfer to the cake tin. 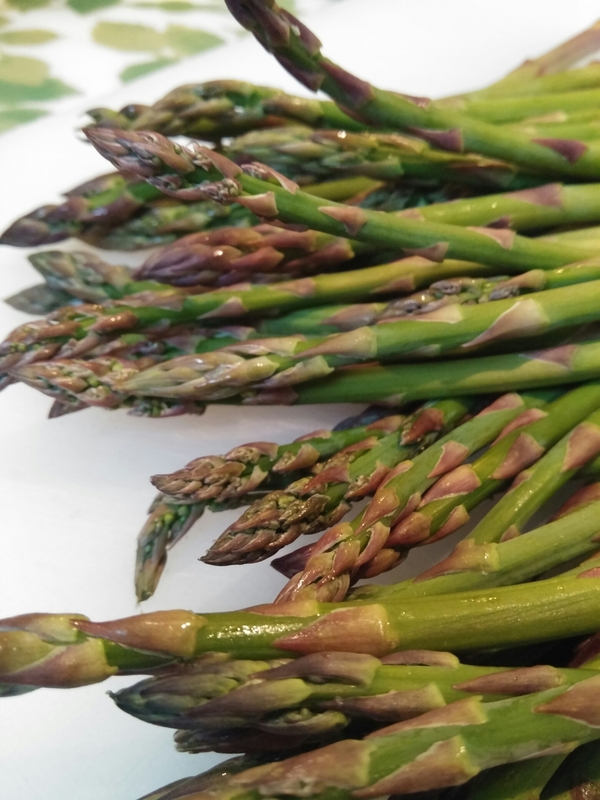 Asparagus season is always so exciting! I was not impressed by asparagus as a child. Back home we had only pickled white asparagus. The colour of it was a little bit off putting. My mum was very curious but we gave up very quickly, as none of us liked it. However I was still determined to try it fresh when I moved to London. And I can honestly say that I just love the fresh green asparagus! So no surprises I have been gorging on it for about 3 weeks now… Some shops sell the thin variety which is super easy to prepare and tastes lovely. My favourite way of having asparagus is in a risotto. I love how well it goes with the rice and peas. A little bit of chilli sauce is excellent to enhance the flavours. I have decided to add some of the goat’s cheese just towards the end of cooking. The crumbled pieces melted beautifully into the risotto and add some delicious nutty flavour. I also like to add a bit of meat just to bring a bit of saltiness and a crisp finish. Sliced chorizo is delicious when fried on a hot pan. In this way each slice crisps up and some of the fat melts away. If you prefer you can also fry a few prawns or just keep the risotto as vegetarian option. Chop the garlic into small pieces or if you have a garlic press put through to create a paste. Fry garlic with olive oil on ow heat until it become darker in colour. Add white wine and leave to simmer until wine and oil incorporate together. Wine is cooked off once all the oily spots disappear and the mixture has one consisted colour. Add the rice and fry further until all liquid is soaked up. Keep on the heat for a bit longer to fry the rice. Add part of a chicken stock and leave to simmer. After 5 minutes add asparagus and frozen peas. Keep pouring the stock as required to keep the rice covered. Keep stirring until mixture starts to thicken. Once rice is cooked, add broken cheese pieces and chilli sauce. Mix well to allow cheese to melt. Fry chorizo slices in a separate pan until crispy. Plate up risotto and decorate with fried chorizo slices. 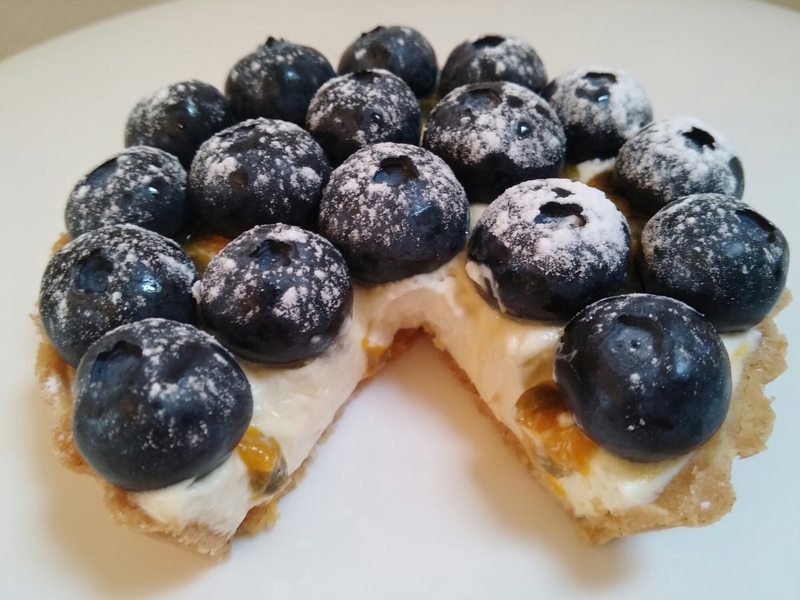 As you probably noticed tarts are somehow my favourite desserts to make. If I am lucky they look and also taste lovely. I am very lucky that my friend has some mini tart tins I could use. This time I decided to up pastry leftovers I had. It was not enough to make another large tart, I thought, so I made four small ones instead. The decorating was no rocket science as I still had some blueberries in the fridge. 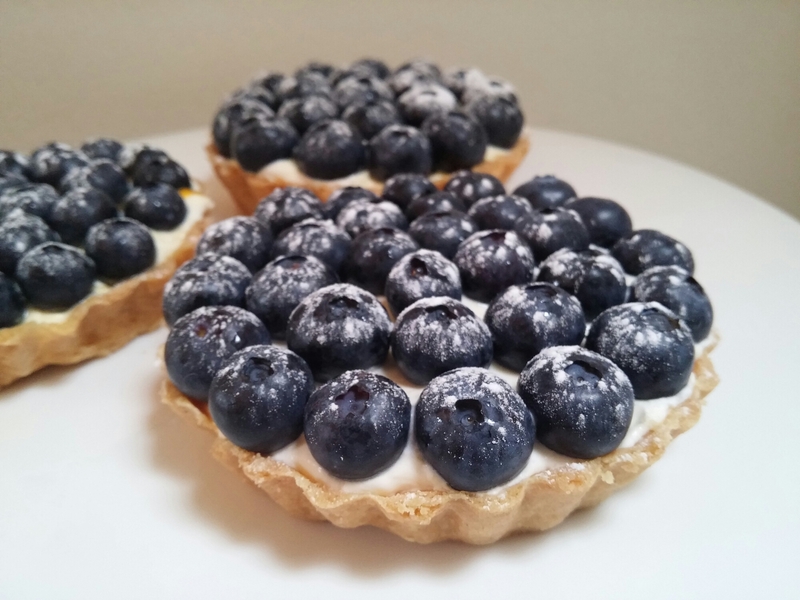 And so in the end I managed to make rather cute looking blueberry tarts with a bit of a passion fruit syrup. I have learnt a few tricks since working with a shortcrust pastry. Never push pastry with a rolling pin to stretch it. Just roll it out with sharp but short strokes. Pastry sometimes crumbles a lot but be patient and it will eventually work. When blind baking always ensure the pastry is crispy and has sort of a biscuity texture before removing the baking parchment with the beans. And once the pastry is turning nicely golden it will be lovely and dry when filled with the cream. For the pastry, rub the butter, with your fingertips, into the flour to create a breadcrumb texture. Shake the bowl every now and then to allow large lumps come to the surface. Once the texture is fairly even sprinkle a little bit of water and work the dough with a round end knife until it come together. Bring the dough together with your hands and tip on a surface. Sprinkle the surface with a bit of flour, this will make it easier when rolling the pastry. Sprinkle a bit more flour on the rolling pin and roll the pastry to about 1 mm thickness. Cut the pastry to a slightly larger size than each tin and lay carefully over each tin. Press the dough into the wrinkled corners of tin using your fingers. Chill for about 20 minutes. Heat the oven to 200 C/180 C fan/ gas 6. cover the pastry with a baking parchment sand fill with baking beans. Blind bake for about 10 minutes and then without the paper for another 5-8 minutes. Take out of the oven once golden in colour and allow to cool down. Trim the edges with a sharp knife to cut the overhanging pastry. Whip the double cream until it is about to thicken and then spread over each pastry shell. Spread some of the passion fruit syrup over each tart. Or if you prefer whip the syrup with the cream. Place blueberries in circles starting with the outer circle. And finally sprinkle a little bit of icing sugar on top. When I think of an early summer I am always reminded of strawberries. They are the first tempting taste of those lovely warm evenings. The gorgeous bright red colour is perfect for the summer and it just gives us a light hint that spring is slowly coming to an end. Ideally strawberries should be collected in late May or June to ensure they had enough time to develop its full fruity flavour. I still remember impatiently grabbing first crop in my parent’s garden. We had mostly forest strawberries that are much smaller and taste very different from the perfect shop bought ones. But the advantage was that they took less time to ripe and their taste was much stronger. However cooking with these little treasures was not an option. Well I guess it would be if we ever left them alone. But we had a perfect excuse of ‘protecting’ them from evil snails. My mum always made some strawberry jam and the making of it made our house smell like fairytale. She loved leaving big pieces of strawberries so that we had juicy chunks mixed with delicious sweet and sticky juice. Later she admitted to us that she just didn’t fancy chopping all the fruits. Apparently she found it far to tedious. This cake is very simple and takes only and hour or so to make. The sponge itself is a basic Victoria Sponge recipe. I love the combination of rich cream with fruitiness of the strawberries and delicious vanilla sponge. You can also add some jam if you wish to sandwich the two sponges. Preheat the oven to 180° C/150° C fan. Grease the 2 sandwich tins with butter and dust with flour, or with greaseproof paper. Whip the softened butter with sugar until pale, and then add eggs, and the rest of the ingredients. Mix until combined. The mixture should be light and easy to spread. Do not over-mix as that would stop sponges from rising. Fill both tins with roughly the same amount of the mixture and place in the oven next to each other. Leave to bake for about 20-25 minutes. You might need to rotate your tins in the oven to allow an even bake. Check the cake after about 20 minutes and test with a toothpick. if the toothpick comes out clean then sponge are done. Set aside to cool for about 5 minutes. Then release both sponges from the tins and leave to cool on the side, preferably on a cooling rack if you have one. Whip the double cream until it is just about to start to thicken. Then spread over both sponges. If you wish you can also spread strawberry jam over the bottom sponge. Place some of the sliced strawberries on the top of the sponge and sandwich both layers together. 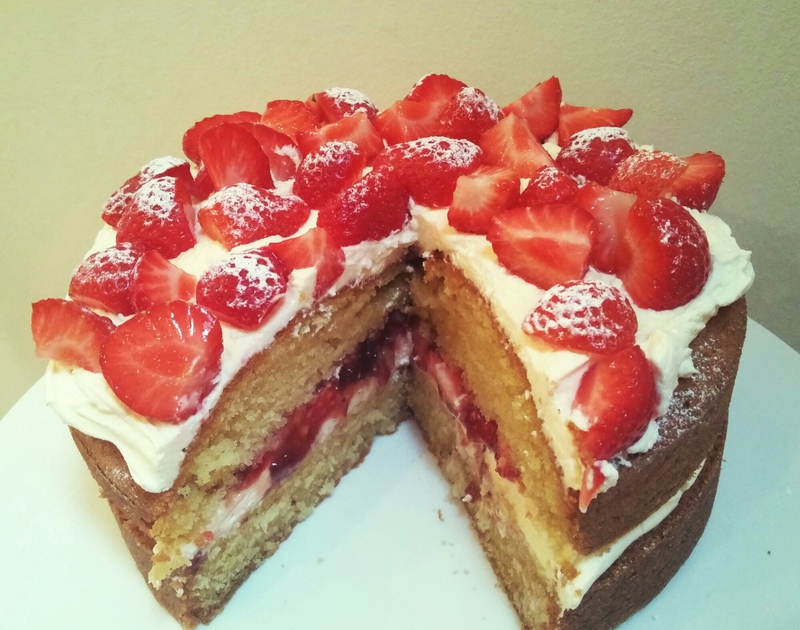 Scatter the rest of the strawberries on the top of the cake and dust with icing sugar. 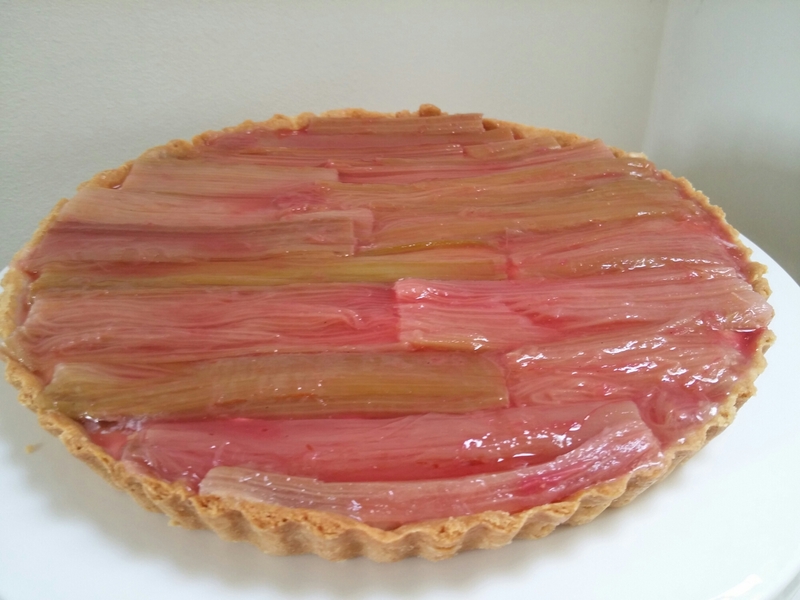 I was thinking recently that I have never tried to bake or prepare rhubarb. This is such an lovely ingredient and still I was never even tempted to try. However this time, I realized that rhubarb is actually in season, as I stood in the veg and fruit section in one of my local shops. So I grabbed a packet and decided to make a tart for my friends as they were coming for lunch in a couple of days. When I make tarts I always prepare my own pastry. I used the shop-bought one a couple of times and I must admit it is an easy option. But I just love making it myself. It is not so difficult and you can most definitely spot the difference in the texture and also in the overall taste. My hands are usually very cold and this is very useful when working with butter. Some recipes suggest to use food processor when starting the breadcrumb process but I prefer to do it myself. In this way I get a better feeling on how much more liquid is needed and how the pastry is binding together. Rhubarb itself is super easy to prepare. I bought the forced rhubarb which was unfortunately more green than lovely pink colour. But once cooked the colour became paler and lighter. I was unsure whether the round tin will work when arranging the stalk. But then I figured out the way of placing each segment without breaking it too much. Put sugar, vanilla essence and lemon sugar with about 300 ml water in a wide pan or casserole and bring to boil over the low heat. Once the sugar is dissolved add the rhubarb batons and ensure that rhubarb is covered with the liquid. Leave to simmer for about 5 minutes. Then take from the heat and allow to cool. Keep the rhubarb in the sirup for another 1 hour or up to 1 day. For the pastry, mix butter and flour with almonds and sugar in a bowl. Use your fingers to break the chunks of butter and to create breadcrumb texture. Stir the ingredients every now and then to allow large chunks come to the surface. Then add egg yolk and dribble of 1-2 tbsp cold water. Knead the pastry briefly to allow all ingredients come together and to form a dough. Wrap in cling film and allow to chill for 30 minutes in the fridge. For creme patisserie, place milk and vanilla essence on the hob and bring to boil on a medium heat. Whilst milk is coming to a boil, whisk the egg yolks and sugar together with flour in a bowl, until pale and light. Pour the hot milk whilst whisking the eggs mixture. Place the mixture back on the medium heat (in a clean pan) and stir continuously until it becomes thick and covers the back of the spoon. Be careful with the heat at this stage, as creme is very likely to stick and burn at the base of the pan. Scrape the creme into a bowl and cover it to prevent the skin formation. Chill for 1 hour and up to 2 days. Roll out the pastry to about 1-2mm thickness and line the tart tin. Press the pastry into the flute edges of the tin and ensure it is also overhanging the edges of the tin. Chill for another 30 minutes. Heat the oven for 200 C/180 C fan/ gas 6. Line the pastry with a baking parchment and place baking beans on top. Blind bake for 20 min and temvoe the baking parchment. Then bake for another 6-8 minutes until pastry is golden and dry. Whilst pastry is still hot trim the edges of the tin with a sharp knife. Cool in the tin. Remove the rhubarb from the syrup and set aside. Then bring the syrup to boil until it becomes thick and sticky. Leave on the side to cool down. Whisk the cream until stiff and carefully fold in the creme patisserie. Fill the pastry case with the creme patiserrie and smooth the surface. Then line the rhubarb on the creme and ensure the whole surface is covered with the rhubarb. 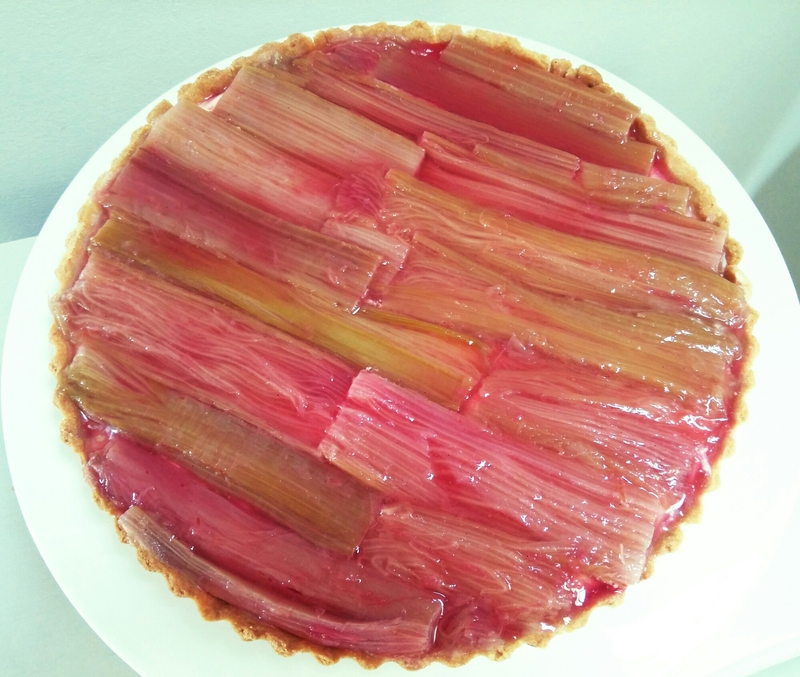 Glaze the tart with the rhubarb syrup and chill for 30 minutes. This caponata pasta is the lighter adaptation of a traditional dish from Sicily which is a true lush vegetarian delight. It would be difficult to define it, because it is simply too good, so essential, yet leaving you with the most fulfilling feeling only a vernacular masterpiece can deliver. Caponata is symphony of warm colours, intense smells and flavours, all mingling with its own ancient history. The aubergine is the protagonist of this dish, combined with celery, tomatoes, onions, capers, olives, pine kernels, basil, and olive oil, lots of it–as you are supposed to fry the vegetables in it. The whole lot is magically concocted with some sugar and a splash of vinegar. It sounds funny today to think that when aubergines arrived in Sicily with the first Arab invasion they were deemed to be apples that had gone off and carriers of diseases. The earliest appearance of caponata in Sicily seems to date to the eighteenth century and its origin is of the poorest ones. A renowned local dish used the fish ‘capone’, quite expensive, which was deep fried and served with a sweet-and-sour sauce made with vinegar. The sauce was so delicious that it started to be prepared with aubergines and tomatoes, some of the cheapest and most available vegetables for anyone, especially those that could not afford the capone fish. Gently cook the garlic in a frying pan with 1 tbsp of hot olive oil, till golden. Chop the washed aubergine and cook at mid-high heat for 10 minutes, tossing them now and then. After 5 minutes, add the sliced sun-dried tomatoes and olives. There is no need to add salt or pepper. After the first ten minutes of cooking, lower the heat to minimum, add the pine kernels, while you put the pasta in salted boiling water–penne usually cook al dente in 11 minutes. Before the last minute of pasta cooking, take the caponata off the fire and add diced mozzarella. One minute later, drain the pasta, add it to the caponata pan, and mix to let the mozzarella melt. Serve hot (! ), with 1 tbsp of fresh olive oil and a couple of sun-dried tomatoes to decorate. You can also add two leaves of fresh basil if you like to strengthen the bitter flavour. A funny fridge-emptier, quickly prepared and very tasty. Vegetarian spaghetti, in this case spiralised courgettes, are just a good excuse to have a weird vegetable pencil-sharpener in the kitchen. It is useful if you feel lazy to prep. I had a few vegetables left in the fridge and Portabellini mushrooms are a good combination with the scamorza cheese which I had bought last week–and forgot about (how?!?). I added half a boiled egg for the sake of colour, mainly, and I apologise to those vegetarians who do not eat eggs. This dish would taste as good also without the egg. The sweet, nutty flavour of the Portabellini mushrooms sings a tasty duet with the smoked scamorza. This is a simple yet fine cheese. It originates in southern Italy, even though my favourite one comes from the central regions like Marche, Abruzzo, and Molise. These regions still remain lands of real famers and you can always go around the countryside and find some fresh scamorza. I love its texture, thick and yet soft, almost spongey and chewy. In the large cheese family, scamorza sits between mozzarella and caciocavallo, and it is prepared with cow milk and warm water. The smoked version is slightly almondy, alabaster coloured, and with a thicker skin than the normal white scamorza, but equally filante–our word for stringy. A truly generous ingredient. Melt the butter in a frying pan on middle heat while you chop the washed mushrooms. I sliced them longitudinally rather than dicing them because they cook better and look nicer. Add the garlic either cleaned and chopped or still unpeeled. When the butter is starting to foam, add the sliced mushrooms and the sage. Cook at medium heat for about 6-7 minutes. While the mushrooms get cooked, prepare the courgetti–or simply finely slice the courgettes with a mandoline slicer. Add the courgette extra bits remaining from the cutting to the mushrooms and cook together for another 2-3 minutes at high heat. Meanwhile, quickly cook the courgetti in a frying pan with the tbsp of oil at mid-high heat. Start serving with a larger nest of your courgetti, on top of which you line a layer of thinly cut scamorza slices. Place the mushrooms still hot on top of the cheese slices, in the middle of your courgetti nest. Add a few scamorza flakes and, eventually, half a boiled egg.